Fitness equipment in a Brewers Hill home. In today’s world, we’re pulled in multiple directions every minute of the day, leaving little time for self care. Even when we make ourselves a priority, there’s often little time left after projects are complete, families are cared for, and we have a moment to breathe. When these motivational moments present themselves, sometimes we don’t have time to make it to our gym or studio. So how do we get a supplemental workout in our home? Make the most of vertical space in your home, like hanging your resistance bands or yoga bag on a hook in an unused closet or over a bar. 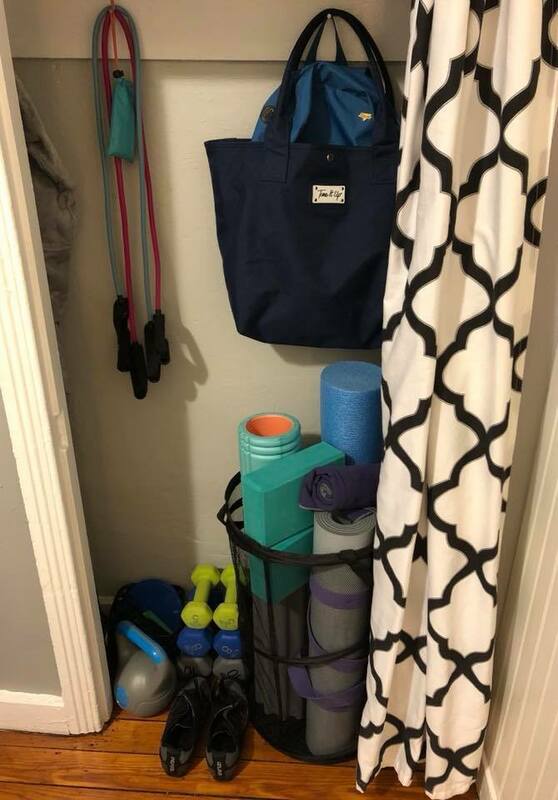 “I have a very small space, but I have my mat and my gear in an old closet that I cleared out and it works beautifully,” says Caitlin Butler, who lives in Arnold. You can also store your items under your coffee table or inside an ottoman to keep them out of plain sight. If you’re keeping things to your room, know that under the bed or night stand is a perfect place for a pair of dumbbells. 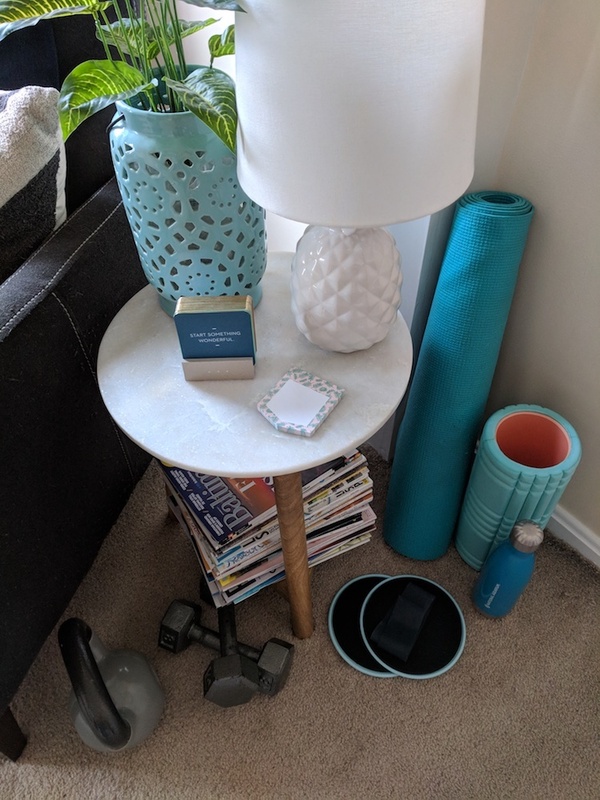 "I’ve got a very limited amount of space in my apartment, so everything I have needs to serve a purpose,” says Brewers Hill resident, Katie VandenHeuvel, who packs her yoga mat, dumbbells, kettlebells, foam roller, sliders, resistance bands, jump rope, TRX bands, and more into a small box. Keep equipment in closets and corners for storage, but make it visible enough that you don't forget your fitness routine. Yoga Mat: Having a yoga mat is typically a great first step no matter what workout you’re planning. Use the mat for your yoga flow or your HIIT workout, adding stability and support. Resistance Band: Bands come in all shapes and sizes, but their best characteristic is that they take up almost no room. “I love my booty bands, because you can throw them in every bag and take them anywhere,” says Locust Point resident, Kayleigh Gelles. These bands can help tone and strengthen your muscles through all types of workouts including yoga, strength and HIIT. They provide added resistance without the heavy weight associated with free weights and, as a bonus, these bands are great for stretching and improving range of motion. Dumbbells: A pair of dumbbells can help you increase your strength. The weight of your dumbbells adds resistance to any move you’re performing at home. “My favorite equipment is my dumbbells—I see the most increase in strength when I incorporate that extra weight,” says Butler. You can use them in focused workouts or you can turn up the intensity of a full body workout. Plus, dumbbells are available in a wide variety of sizes and weights. Water Bottle: Yes, of course you’ll need water wherever you’re working out but people don’t always keep their water close. Just think: If you only have 10 minutes, do you want to spend even two of those minutes going to the kitchen to search for your water bottle? Sliders: Sliding discs are another small item that pack a big punch. They are incredibly compact and easily portable, making them perfect for a home gym. When using sliders, your body is challenged to utilize stabilizer muscles, increasing the difficulty of your workout moves. Kettlebell: Much like your dumbbells, a kettlebell is a great way to add weighted resistance to your workouts. “I like to keep a variety of dumbbells along with a kettlebell and medicine ball,” says Belvedere resident Jeff St Pierre. 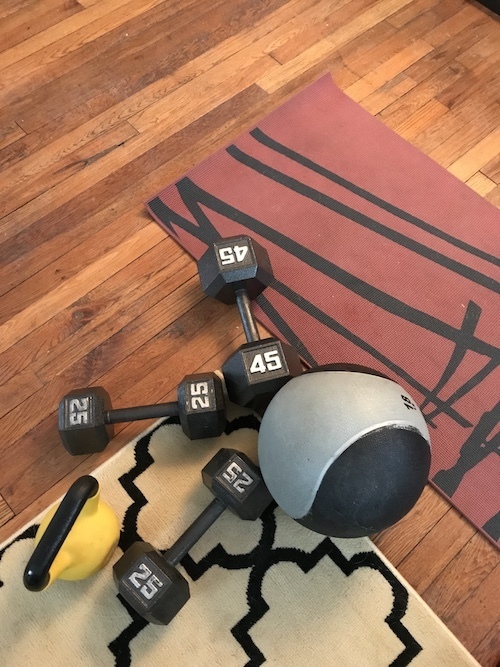 “You don't need a lot to get the job done.” Unlike a dumbbell, which has evenly distributed weight on each end of the handle, a kettlebell’s weight is in the center causing an offset of gravity away from the handle. When used correctly, they can be an extremely effective training tool. Correct use, form, and care of each piece of fitness equipment is incredibly important to your health and safety. Whenever you plan an unsupervised workout at home, make sure you do your research on your equipment and talk to a trainer before your workouts.